Poor Max. Annoyed one too many times by his little brother, Felix, Max makes a wish that he would just go away. He finds a banishment spell on the internet and wouldn't you know it, the spell actually works and his wish comes true. Felix is spirited away by a monster to a magical world and Max, filled with regret, follows behind to try and save his brother. 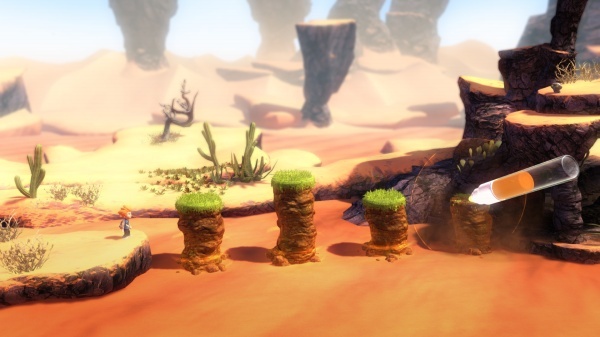 Max: The Curse of Brotherhood is a gorgeous looking puzzle platformer with a bit of a twist. Max is granted a magical marker by a kindly sorcerous that you can use to manipulate the environment. At first you'll have the power to move earth, raising and lowering platforms to help you cross dangerous gaps or to solve the puzzles that are impeding your progress. As you make your way further into the game, you'll discover new ways to use the marker such as to draw vines to scale or slide down or to create waterspouts to reach new heights. The game ease you into each new power, letting you get a little practice with them before ratcheting up the challenge and forcing you to use your brain as much as your fingers. None of the puzzles are diabolical or cheap, but there will inevitably be some trial and error on your part and you'll find that the game has thousands of ways for you to die. Luckily the game is very generous with its checkpoints and your lives are unlimited, so it's easy to experiment and to get right back on that horse when you fail. In addition to its puzzle sections, the game has plenty of platform stretches which are designed to keep you moving quickly forward with elements such as collapsing bridges, rope swings, and falling boulders. There are enemies to contend with, but in this game the emphasis is on avoidance and threat neutralization rather than elimination. There are also several adrenaline inducing chases as well that will test your reflexes and platforming skills. The controls are tight and responsive, so any deaths during all of these different sequences will generally by your own fault. If you're looking for more challenge, though, there are hidden items to find in the game that will take some extra effort to find. Visually, the game is stunning, looking everything like a next-gen platformer. Although a 2D side-scroller, the world looks a very lifelike 3D. The colors are brilliant, the lighting effects impressive, and the game's world is packed with detail. If it were a computer animated feature film, it would be one of the better looking releases of the past year. I had a great time with Max: The Curse of Brotherhood, and was very pleasantly surprised by it because I didn't really have any expectations for the game going in. If you're not averse to playing a platform game now and then, it's an easy game to recommend. Final Rating: 90%. One of the best games that you can buy for your new Xbox One is an inexpensive download.